It has been two weeks since my last post and I am realizing that writing them on a weekly basis is harder than expected. This morning I am sitting in front of my computer waiting for the weather to warm up so I can do a short bike ride before heading out to a BBQ this afternoon. A few days ago I prepared some examples around PS Photomerge which in the end didn’t look too convincing. So I looked through some of my recent images, not too many I have to admit, and found one shot that triggered a little insight story. If this feels like a quick morning write-up then maybe because it is. It is helping me to keep up the routine and hopefully tells someone something interesting. I am going to write about manual control and presetting the camera for a very specific lighting situation. 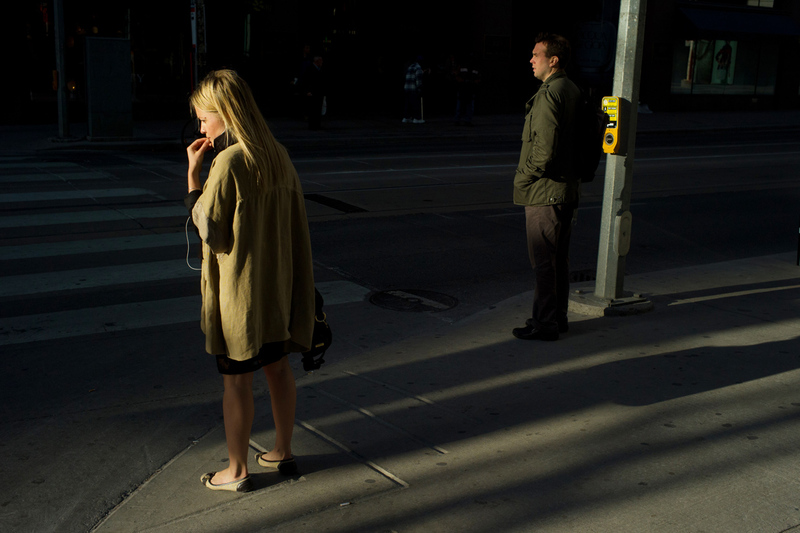 Have a look at this image of this this woman in the streets of Toronto. She is thinking about something, maybe her job, her relationship, her family, who knows. What I find interesting is how she seems to be illuminated in front of the dark background. Its like being in the spotlight. This kind of lighting you can find in cities during the early morning or late afternoon hours when the sun is close to the horizon. It drops long/dark shadows and creates very high contrast between the sunny spots and the dark structures, which hide in the background. Whenever I see this it makes me think of stage design and the various effects of stage lighting. Here we have natural stage lighting, an urban stage. For photographers it is a challenging lighting situation, which can actually be easy to deal with. First step is to set the camera to manual controls. Anything else will most likely screw up the image. Have a look at the image again. Most cameras with more centered exposure control would measure the dark shadow in the center of the image. The result would be a medium gray background and a fully overexposed person. Other cameras with a wider area for exposure measurements will most likely try to find a balance between the bright area and the dark. The result would just look flat. Cameras see light differently than the human eye. When we walk through such a scene our eyes constantly adjust to the lighting. “Exposure” and “focus” shift within split seconds. That is why we can deal with very contrasty scenes. It gives us the impression that we see detail in dark shadows and bright sunlight almost at the same time. A camera can do the same but when you press the shutter you freeze that moment and the image is either exposed for the bright light or the darks. Unless it has super dynamic range, it can not capture both. That’s when people get disappointed with their results because parts are under or over exposed and that’s not how they remember that moment. Since the beginning of photography this has been a problem. Photographers tried to extend the dynamic range of film by pushing it in the developing phase. Nowadays more and more photographers use HDR techniques to capture high and low light elements of a scene, which then get merged together into one photo. This works well if nothing moves and ideally if you have a tripod. Since the beginning of photography people have used this limitation as well to find expressions which are different from what the human eye captures. Working with high contrast can lead to results which could look different, more focused on one detail. Everybody has probably seen beautiful black&white photography with some deep, black shadow being used as an aesthetic element. The photographer exposes for the main object in the light, knowing that the shadow will appear much darker. Same with the street image in Toronto. The background appeared dark, but not that dark. Back to manual settings. What works for me is to set the camera to a setting that exposes correctly in the sunny spots. To do this I point the camera down to the pavement, which is usually mid gray. (Every camera is calibrated on a mid gray. Point at something black and the camera will overexpose, the result will look mid gray. Point at a white sheet and the camera will underexpose, the result will look mid gray. Point at something mid gray and it will look mid gray. That’s why photographers use gray cards. Street pavement works as well. Some use their hands knowing how it relates to a gray card. Even with modern cameras you see professional photographers pointing their cameras at gray areas or at their palms). I set the camera to the correct exposure for the bright area and then I wait for people to walk into the spotlight. There is no need to adjust. With the camera set up that way I can walk along the streets and whenever I see an interesting person I wait for it to step into the sun. Or you wait at the sunny spot and see who walks by. Push the shutter, done. In one of the next posts I will write about how to set up a real stage on the street by using a flash. The cropped cows Does an upgrade from an M9 to a Leica M9-P make sense?